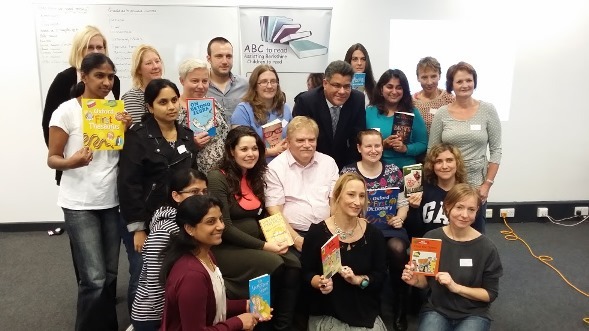 Alok Sharma, the Member of Parliament for Reading West, on Saturday 26th October 2013, attended an Educational Parents Workshop organised by local charity ABC to Read. ABC to Read is a Berkshire based charity organisation, supporting children who are struggling with learning to read. The charity believes that children benefit enormously when parents show a genuine interest in them and provides training for parents to enable them to help their own children at home. The charity also provides volunteer reading mentors and training for parent helpers already in school. The free event, which coincided with National Parents Week (21 – 27 October), was held at Reading College and aimed to help parents understand how they can support their children to succeed and enjoy reading. During the workshop parents were shown how to make the time spent reading with their children enjoyable for both them and their child, building the child’s confidence and pride in their abilities. One of the key themes of the workshop was to help parents to been seen by their children as a helper and a friend and a not as a teacher. Speaking to attendees at the beginning of the workshop, Alok discussed his own experience of helping his two daughters to read and the importance of reading to a child’s future.